Ensuring medication safety is perhaps a pharmacist’s most critical responsibility. To fulfill this duty, pharmacists must develop a comprehensive approach to medication safety that includes maximizing use of the available resources. 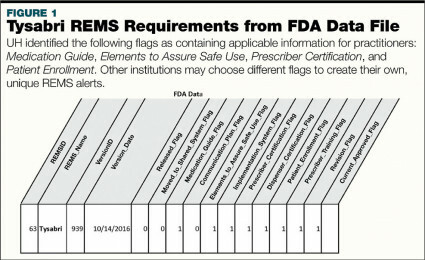 Critical to this endeavor is making sure that the organization complies with all the conditions for drugs with risk evaluation and mitigation strategies (REMS), in order to ensure that the benefits of those medications outweigh their risks (see online-only SIDEBAR1-4 for specific elements of REMS). 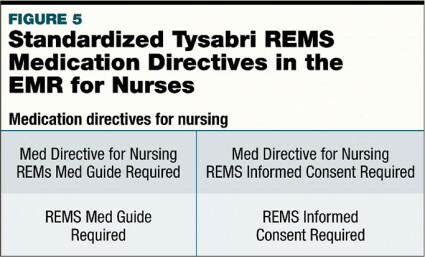 It is essential that prescribers, pharmacists, and nurses are aware of the specifics of each REMS program.5 However, because each REMS is unique to the medication (or medication class), disseminating appropriate information to practitioners about various REMS programs can be challenging. As the medication experts, pharmacists should play an active role in educating staff on REMS requirements and in developing and reviewing REMS alerts in the electronic medical record (EMR). Practitioners should maximize use of the REMS@FDA website to inform their REMS programs. A key method for improving the accuracy of the REMS information available to staff is to develop standardized REMS alerts in the EMR. With extensive knowledge and experience using REMS medications, pharmacists are well suited to take a leadership role in this pursuit. See the CASE STUDY for one health system’s experience maximizing use of the REMS@FDA website to improve EMR alerts. As the FDA continues to develop new REMS resources, the ease of standardizing programs and creating alerting mechanisms for prescribers, pharmacists, and nurses will continue to improve. 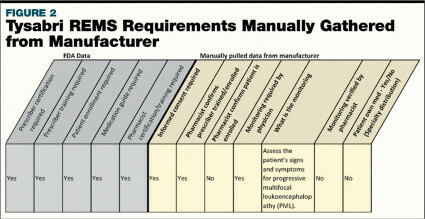 For example, using structured product labeling (SPL) for REMS requirements will give those documents a consistent format, allowing them to be incorporated more easily into EMRs.6,7 Further research should assess prescriber and pharmacist response to standardized REMS alerts, the effects of the alerts on workflow, and rates of adherence to REMS requirements in institutional settings based on EMR alert usage. University Hospitals (UH), a large, fifteen-hospital health system, provides patient-centered care at locations throughout Northeast Ohio. The system’s 1032-bed, tertiary care medical center, an affiliate of Case Western Reserve University, includes a babies and children’s hospital and a National Cancer Institute-designated comprehensive cancer center. Ensuring that prescribers, pharmacists, and nurses throughout UH are aware of REMS requirements for all program drugs is critical to maintaining compliance and ensuring the safety of our patients. Thus, developing effective, accurate REMS EMR alerts, and keeping them current, is crucial. Maintaining REMS EMR alerts has historically been a time-consuming, manual process at UH. In 2016, UH began a project to improve the quality of our REMS alerts and ensure they could be updated efficiently by utilizing information gleaned from the REMS@FDA website. Our overriding objective was to develop an efficient, replicable process to create standardized informational REMS alerts for the health system’s EMR. Download the appropriate data file from the REMS@FDA website. UH used the REMS Versions data file,1 which includes information such as drug name, ETASU status, prescriber/pharmacy certification requirements, if the patient needs to be enrolled in a registry program, training requirements, and if a medication guide is required. Export the data file into a spreadsheet and filter the results to identify the active REMS programs. Identify the applicable information for practitioners, chosen from various flags in the file. 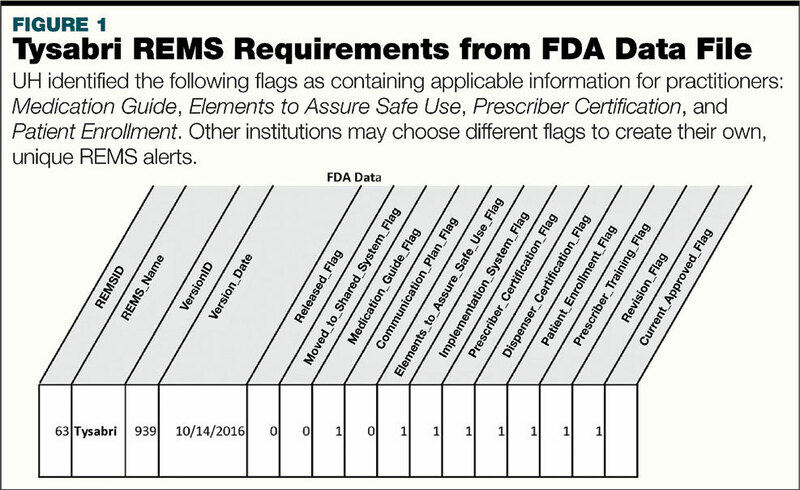 UH chose to include information from the following flags: Medication Guide, Elements to Assure Safe Use, Prescriber Certification, and Patient Enrollment. UH selected these as applicable to practitioners. Other institutions may choose different flags to create their own, unique REMS alerts. Translate these flags from numbers (ie, 0 or 1) into Yes/No statements (ie, 0=No and 1=Yes). Yes indicates applicable to practitioners; no indicates not applicable to practitioners. Manually add additional information of interest from each manufacturer’s REMS website. For example, UH manually added specific information about required monitoring. Utilize the Concatenate text function8 within the spreadsheet (which links multiple statements together) to connect the “Yes” and “No” statements and create a full alert message. UH built a REMS alert for each medication with a REMS that includes ETASU. Information of interest to the different practitioners was determined based on the information available from the FDA. If it was identified as prescriber- or pharmacist-specific, the information was included in the alert. For nursing, when medication guides and/or informed consent were required, medication directives were created. The following figures illustrate an example REMS alert for Tysabri (natalizumab, an IV monoclonal antibody for treating relapsing multiple sclerosis); FIGURE 1 includes REMS requirements from the FDA data file, while FIGURE 2 incorporates REMS requirements manually gathered from the manufacturer as well. 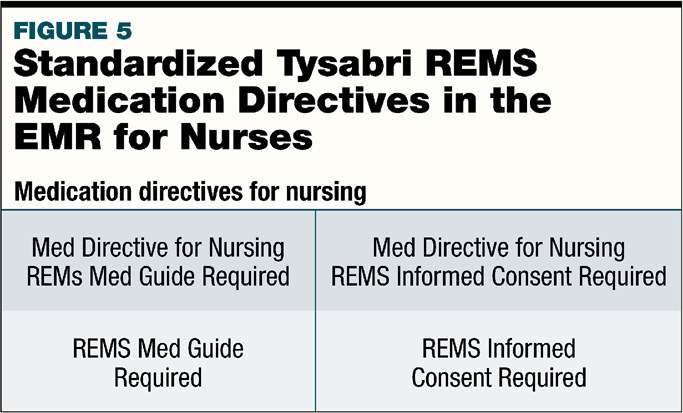 The pharmacy informatics team then built the alerts for Tysabri into the EMR as alerts for prescribers (FIGURE 3) and pharmacists (FIGURE 4); alerts related to medication directives were also created for nursing (FIGURE 5). The new REMS alerts are visible at the point of prescribing, upon pharmacist verification, and during medication administration. By the end of 2019, all hospitals in the health system will utilize a single EMR and will receive these improved informational alerts. UH’s new REMS EMR alert development process has decreased the time required to perform the annual review of REMS alerts from multiple months to 1 month. The alert approval process is streamlined, simple, and easy to navigate. Our future goals include evaluating how the alerts have increased practitioner awareness of REMS programs and lessened practitioner burden in adhering to REMS requirements. Abby Gallagher, PharmD, MHSA, is a PGY2 internal medicine pharmacy resident at NorthShore University Health System in Glenview, Illinois. Stephanie Tchen, PharmD, is a PGY2 critical care pharmacy resident at Community Health Center in Toms River, New Jersey. Joseph Moss, PharmD, MBA, DPLA, is the 340B program coordinator for system pharmacy services at University Hospitals in Cleveland, Ohio. Karen Houser, RPh, is a clinical pharmacist at University Hospitals Specialty Pharmacy in Warrensville Heights, Ohio. Amber Jones, RPh, is manager of pharmacy informatics IT&S at University Hospitals in Cleveland, Ohio. Indrani Kar, PharmD, is the drug policy/formulary specialist for system pharmacy services at University Hospitals in Cleveland, Ohio. Approved Risk Evaluation and Mitigation Strategies (REMS). FDA. www.accessdata.fda.gov/scripts/cder/rems. Accessed January 31, 2019.
foodanddrugadministrationamendmentsactof2007/default.htm. Accessed January 31, 2019. FDA Basics Webinar: A Brief Overview of Risk Evaluation and Mitigation Strategies (REMS). www.fda.gov/AboutFDA/Transparency/Basics/ucm325201.htm. Accessed January 31, 2019. Boudes PF. Drugs R D. 2017;17(2):245-254. ForIndustry/UserFees/PrescriptionDrugUserFee/UCM415751.pdf. Accessed January 31, 2019. FDA. CDER SBIA Webinar Series. REMS in Structured Product Labeling Format: An Introduction. Adam Kroetsch (January 26, 2017). www.fda.gov/downloads/Drugs/DevelopmentApprovalProcess/SmallBusinessAssistance/UCM563796.pdf. Accessed February 15, 2019. Concatenate function—Office Support. https://support.office.com/en-us/article/CONCATENATE-function-8f8ae884-2ca8-4f7a-b093-75d702bea31d. Accessed January 31, 2019. ETASU requirements are the most extensive elements of REMS.